Week 4 has teams on byes so the schedule isn't as full. Still, there's some match-ups to be looked at. Week 4 is around the corner and there's some good games out there. Chargers lead the way with the largest spread at -10 and climbing over the 49ers. We take a look at a couple of NFC North teams and an AFC South match-up. Chicago Bears Tampa Bay Buccaneers 4-1 7-1 46.5 -160 -3 0 0 0 -160 0 46.5 -160 -3 0 0 46.5 -161 -3 46.5 -155 -3 Bears -3 - Chicago found a way to get it done on the road against the Cardinals last week, struggling on offense and relying on its revamped defense. They get the Bucs, coming off a short week, back at home and sit at 2-1. Tampa will face its first real defense after seeing the Saints, Eagles, and Steelers and also has to travel on a short week. 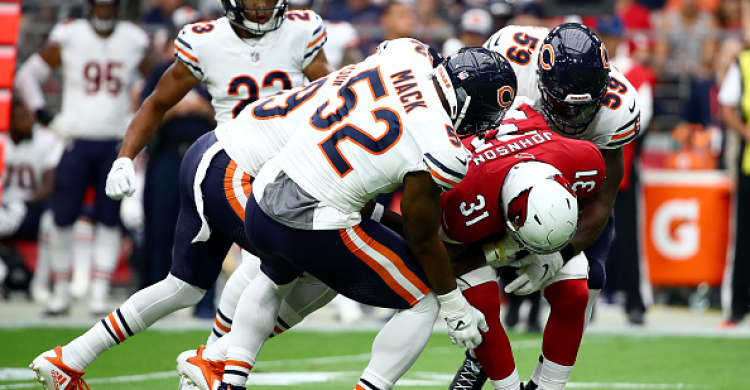 Chicago has a ridiculous 12.4% sack percentage this year, almost double last year, and you can thank Jon Gruden for that. Take the home team in a close match-up between two surprise teams. Minnesota Vikings Los Angeles Rams 2-3 3-4 50 240 0 0 0 49 240 0 49 240 0 0 0 49.5 220 0 49.5 240 0 Vikings +7 - Minnesota? Not good. Last week against Buffalo was a terrible display of football and what do you get for a bounce back? The best team in football on the road. The optics don't look great, but the Rams won't have Aquib Talib and possibly, Marcus Peters, both hurt. Getting a full score on a short week is worth the gamble. Houston Texans Indianapolis Colts 3-2 5-3 47.5 100 -1 0 0 47 100 0 47.5 100 -1 0 0 47 -103 -1 47.5 112 -1.5 Texans/Colts U 46.5 - Both teams just don't look good on offense. Andrew Luck still looks hurt and Jacoby Brissett took over hail mary duties last week. The Texans O has struggled mightly and needed a late second half burst to even make their game against the Giants interesting. The Colts have started the season 3-for-3 in unders and have gone under the total in 10-of-11. It's only been ten years since the over hit in this matchup when playing in Indianapolis.